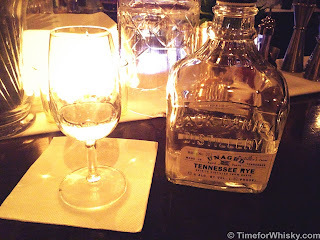 At Eau de Vie recently I noticed a bottle of JD Unaged Tennessee Rye on the shelf. I hadn't seen this in Australia before (its release in January 2013 was mostly a US-centric one), so jumped at the chance to try it. Nose: Bananas and bubblegum (Steph says "metho"). Palate: Smooth! That was a surprise. No real dominant flavours - still hints of banana, and clearly extremely young (Steph says "metho"). Finish: Short as expected. Reminds me of a young, but not completely unaged rye. Still a bit of complexity evident to the end. Obviously needs (a lot) of time, but it wasn't horrible. (Steph still says "metho"). Rating (on my very non-scientific scale): 79/100. 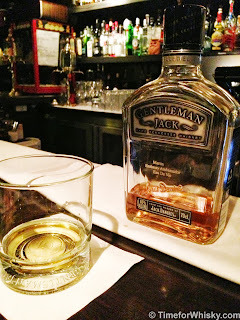 Let's be honest - whisky gets aged for a reason, and whilst this wasn't something I'd drink every day, it was an interesting way to see what JD rye is like before it ever sees a barrel. And it wasn't horrible by any stretch of the imagination - I'd happily drink it again (just not if a nicely aged whisky was on offer). Before finishing off the night, Steph and I enjoyed a dram from our (sadly now very low!) bottle of JD kept for us at Eau de Vie, as part of Brown Forman's fantastic "Jack Daniels Embassy" program.